A place just for guys to talk. I am 16 years old, male, 179 cm's tall and was 101.6 kg's but am now 97.9 kg's .I have lost 3.7 kg's in the last 4 weeks and want to reach my goal weight of 85 kg's and tone up. I am quite happy about this as I have been mainly doing bike riding with the occasional walking or running. This year I suffered from an injury called 'Osteitis Pubis' which effects the groin area and restricts your ability to run and kick a football. This meant that I could not do much for 5 months. So as you would suspect my fitness levels are pretty crappy. My fitness levels have increased a little bit over the last 4 weeks but over the next 2 months i would really like to build my fitness up so I am around the 70-75% of my maximum fitness levels. I would have liked to run more often and for longer distances but i get an awful burning sensation in my feet. It feels like there on fire. I can understand that they might hurt a little bit because I have been inactive for the last 5 months. The only exercise that I have done is be waterboy for my local footy team because I couldn't play because of my injury. Has anybody else suffered from this sought of pain in their feet? If so what can I do to prevent it or do I just have to push through the pain and it goes away after a while? By the way I also wear orthotics in my shoes because I have flat feet. I was doing free weights but suffered from free weights sore arms (in the bicep and tricep areas) and sore shoulders. I thought this was because I may be lifting the weights incorectly or I may not have alot of strength in these areas of my body. I have not partaken in any weight lifting exercises in the last 3 weeks and the pain has pretty much gone. My body measurements are as follows, chest 106 cm, abdominals 96 cm, thighs 66 cm and my arms are 40.5 cm. When I reach my goal weight I would like my measurements to be as follows, chest 90 cm, abdominals 80 cm, thighs 60 cm and my arms to be 35 cm. Does this sound reasonable. As I stated before I am doing plenty of bike riding and occasionally participating in walking/running. I will hopefully be participating in swimming once or twice a week as this builds my aerobic system without having a high impact on my muscles in the body. i.e. causing fatigue or sore muscles. I am going to start my strength circuit again 2 or 3 times a week. This will consist of ankle touches, push-ups, squats, dips, bicep curls, hip rolls, dumbbell bench presses, dumbbell lateral raises, dumbbell dead lifts and lots of stretching. I will be using a 4 or 5 kg dumbbell and be doing 2 sets of 12 repititions to start. Does these exercises sound right for the areas that I want to target to reduce my body fat and tone up. Please fell free to provide me with more exercises if you feel that they will be benefical and help me reach my goals. 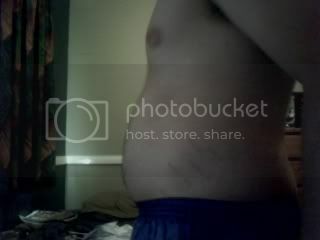 Heres what i look like now and i would like to have a flat stomach with some evidence of toneage. Hey mate, nice to have you post! I don't recommend losing weight in a short period of time, this is bad because it is bad for you, plus you'll probably get flabby skin and possibly stretch marks (like those on your sides now). What are you eating now? First thing to do when trying to lose weight is detach yourself from your peers' diets... this is something I wish I had learnt early on. Basically what I mean by this is - just because everyone else is having pizza, chocolate, lollies, chips and all sorts of junkfood in every day life... they can do this because they are aliens!... or because they're thin and metabolise food faster than you do. Think of yourself as a car with great fuel economy (Like a turbo-diesel VW golf)... a litre of petrol will take you much further than a Ferrari will. Once you've cut out ALL junk foods you can focus on eating even better. Have more frequent but smaller meals. Rather than the typical 3 meals a day, try 6. They become more like snacks, to keep you going. Main things to eat - small bowl of rolled oats/porridge in the morning. Small amount of chicken breast and veges just before midday. Lunch time - slightly bigger amount of chicken breast and veges. Night - You could swap it around, and either have a meal supplement, or protein+veges/fruit. Exercise - I go interval running at night. This involves running/jogging for a period of time, then slowing to a walk for the same period of time... you can start out doing this for 2-3 minute intervals and build up to doing 5-10 minute intervals. This builds your fitness like nothing else, I've found. I think you have started well because you have a good plan on what you want to do. I have also suffered from the burning sensation that you speak. I found that better shoes helped remedy this until I lost some weight and took the pressure off my feet. This can be expensive so there are other ways around this. One option is to head to the pool to do water running. Trying to go straight into swimming can be very taxing and hard work. But by going run it requries six times the force to run through the water as apposed to on land. This will help by giving you a good workout with no impact but by also strengthing the muscles in the feet and lower leg to offer more support to your feet thereby making it easier on your feet. In regards to your workout it does look like a good overall body workout. Couple of things you might like to keep an eye on is your core. If you can strengthen your core as you go you will be less susceptible to over use injuries because you will have a stronger base. Stretching is very important too. You will not get as much discomfort post workout if you spend 10 - 15 minutes before and after each session to stretch. This is also important because as you build muscle you will lose flexibility and it will put more pressure on them. Also, try the one arm seated row. This will be good to help your shoulders as well. The Men's Heath magazine and website can be a very useless tool to get new ideas to keep your workouts fresh and get the best benefits out of them. cheers for the info, what sought of core exercises do you do? Oh I forgot to talk about that - a friend got fractures in the base of his feet because he was running too heavy on his feet. So if you don't want to go swimming as GotNothing suggested (although atleast get it a go I reckon) then try walking which is lower-impact than running. Other exercises (as found at gyms) - bike and cross-trainer. Or go bike riding everywhere - use it as a form of transportation. Hey fellas I was just wondering if you guys could share with me your secrets and exercises for what you did to reduce your waistlines. raiders07 wrote: Hey fellas I was just wondering if you guys could share with me your secrets and exercises for what you did to reduce your waistlines. Hey mate. My suggestion is to to get a gym membership. It has really really helped me alot. I also suffered from unexplainable burning feet when i run, had it even when i was thin. The best thing about the gym is that it gives you access to cross trainers, which are just like running on a treadmill but with no impact, which illuminates the problem with the feet. You are very tall for a 16 year old, a few months at the gym and im sure you will be buff as. There is no secret to weightloss. Calories consumed needs to be less than calories burnt. A healthy structured diet containing plenty of fresh fruit and vegetables, along with fish, chicken, meat and eggs in moderation coupled with at least 45 mins a day of exercise will lead to you losing weight. Weightloss is mainly mental. You need to make the conscious choice to not eat that pizza. You need to make the conscious choice to go to the gym or for that walk. I had a similar problem with not being able to run when I was your age... I had issues with the football boots that I was using which was causing an extremely bad pain in the arch of the feet. To get around this, firstly I tried lots of other types of fitness, like swimming and walking, however, after time, the pain seemed to leave me, which made me realise that it was due to incorrect shoes. Have you tried swimming? It's a great low impact way to raise your heartrate up to the required levels. Ignore my previous post, I didn't finish reading your post. As for food, I agree with the other comments, keep your carbs down, and your protein high, If you are eating carbs, try and stick to wholegrain options, and not the refined stuff you find in white bread, pasta, rice etc. Try and eat your carbs earlier in the day, and have a good sized breakfast etc. to kick-start your metabolism. Try and add in a small snack around 1 hour before you eat your main meals, such as a peice of fruit, or a smoothie, to also build up your metabolism. I'd second that call not to try and lose it all overnight. It takes time and is more likely to stay off if you do it sensibly. Last edited by CronicBadger on Thu Dec 01, 2011 12:12 am, edited 1 time in total. I will be using a 4 or 5 kg dumbbell and be doing 2 sets of 12 repititions to start. Does these exercises sound right for the areas that I want to target to reduce my body fat and tone up. If your looking to lose weight and tone up then you want to do much higher repititions eg 30 reps if the weight of 4 or 5 is to heavy to do that amount then make it lighter , if your looking to bulk up you would do reps of 5 , 10 or 12 but if your looking to tone up then higher reps are diffinatly the better option good luck m8.